Assigning and deactivating licenses - for companies with multiple Premium subscriptions. Ghost Browser now uses a login system (username and password) to activate the browser. This means that our previous system of using license keys to activate and assign access to the browser has been retired. This will make life a lot easier for people using Ghost Browser on multiple computers and it will make it much easier for team admins to manage their team subscriptions. If you manage the subscriptions for your team, you will now be able to easily assign one of your subscriptions to a team member using their email address. 1. To purchase a Ghost Browser Premium License please click here. Note: If you already have an account, make sure to log into your account so that your licenses are added to your current account. If you're a new subscriber please create an account. 2. After purchasing licenses, you will be directed to a purchase confirmation page that lists your subscription details as well as a link to download a .pdf of your invoice. 3. To assign this new license to one of your team members, go to your account page. 4. On the Add/Remove Users tab, at the top of the page you will see the Licenses Purchased by (You) section. 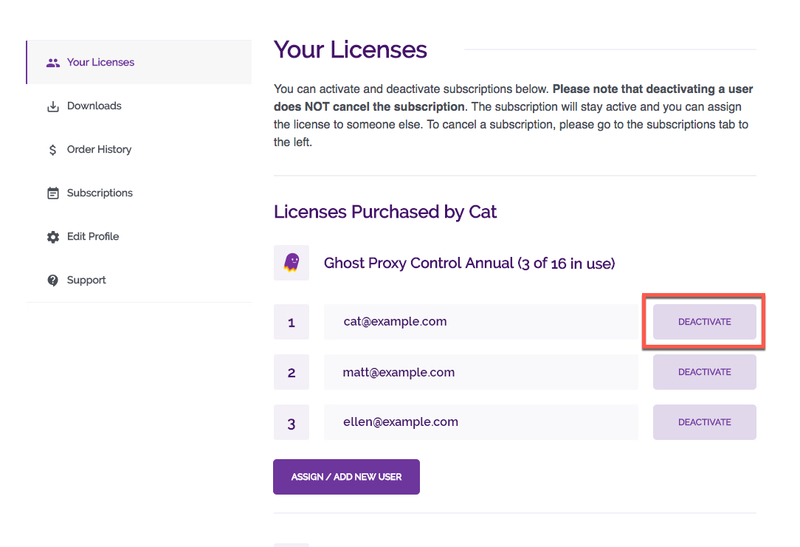 Your licenses will be listed by license type, for example Ghost Browser Annual or Ghost Proxy Control. To assign one of your licenses to a team member click the Assign / Add new user button under the category for which type of license you want to assign. 5. A form will appear for you to enter your team member's email address. Enter their email address and click the License User button. 6. If the email address you have entered is not already registered with an account on our website you will be prompted to create an account for them at that time. They will set their own password. 7. You will then see their email address listed below the license type you have assigned to them. You will also see the number of licenses you have assigned compared to the number you have available to assign. For example: Ghost Browser Annual (1 of 16 in use). 8. The team member will get an email confirmation to the email address you entered with instructions on how to create a password for their account if they're a new user and instructions on how to activate the browser. If someone is no longer on your team you can deactivate their license and assign it to a new user when you're ready. To deactivate their license follow the steps below. 1. On the Add / Remove Users tab in your account, find the user you want to deactivate under the license type you want to deactivate (Ghost Browser Annual or Ghost Proxy Control Annual for example). 2. Next to their email address you'll see a button that says, Deactivate. Click that button. 3. Their email address will be removed from the list of licenses for which you have deactivated them. 4. If they have any licenses follow the same steps to deactivate those licenses as well.